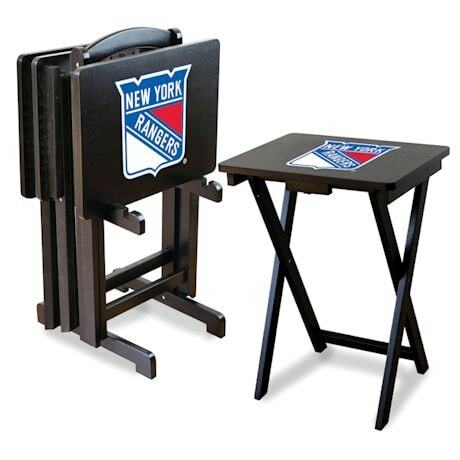 Show your team spirit with the NHL Official Licensed TV Snack Tray Set. The heavy duty trays and storage rack are made from select hardwoods that are finished with a durable, easy to clean surface so you don't have to worry about stains. Team logos are silk-screened on the top of each tray. When you are done snacking, put the trays back into the storage rack to keep things neat and clean. Set of 4. Each tray measures 26"L x 19"W x 14.5"H. Made in China.